Poker has taken America by storm. But it’s not just any form of poker that has people across the country so excited it’s no-limit hold ’em the main event game. And now, thanks to televised tournaments, tens of thousands of new players are eager to claim their share of poker glory. In the first volume of this series, Harrington on Hold ’em: Volume I: Strategic Play, Dan Harrington explained how to play in the early phases of tournaments, when most players at the table had plenty of chips, and the blinds and antes were small. 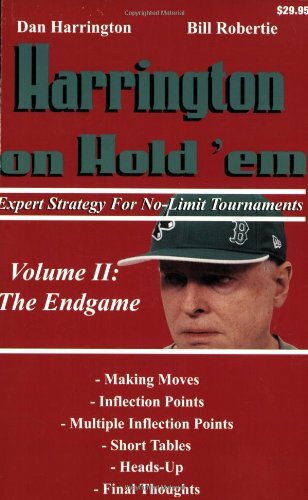 This book, Harrington on Hold ’em: Volume II: The Endgame shows you how to play in the later phases of a tournament, when the field has been cut down, the blinds and antes are growing, and the big prize money is within sight. Harrington shows you how to make moves, handle tricky inflection point plays, and maneuver when the tournament is down to its last few players and the end is in sight. He’s also included a whole chapter on heads-up play, whose strategies up to now have been a closely-guarded secret of the game’s top masters. Dan Harrington won the gold bracelet and the World Champion title at the $10,000 buy-in No-Limit Hold ’em Championship at the 1995 World Series of Poker. And he was the only player to make it to the final table in 2003 (field of 839) and 2004 (field of 2,576) considered by cognoscenti to be the greatest accomplishment in WSOP history. In Harrington on Hold ’em, Harrington and two-time World Backgammon Champion Bill Robertie have written the definitive book on no-limit hold ’em for players who want to win and win big. Posted in Poker | Tags: endgame, expert, harrington, hold, limit, strategy, tournaments, vol.